. : MAIN DEPARTURE POINTS IN SYDNEY :. 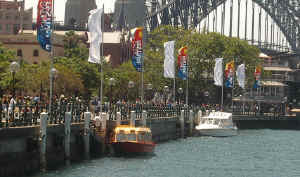 For the majority of skippered boats, they can depart from any of the public wharves around the city area – ie from Birkenhead Point to Rose Bay. Exceptions to these are larger boats, like James Craig, Constellation etc and some specialist boats like Lady Hopetoun. Those that have their home berth up the Parramatta River will also not charge for departing from areas there. 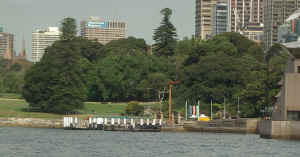 Manly and Middle Harbour areas are not ideal for most boats as they have to have special licences to cross the Sydney Heads in all conditions, and there are not a lot of access wharves at the Spit. Please email for information for boats that can depart these areas. 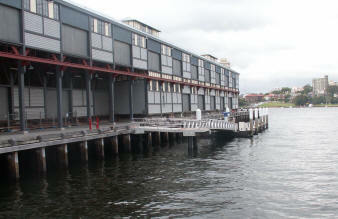 Cost: Most of the city wharves require booking through Maritime NSW which charge a fee to use the wharf. 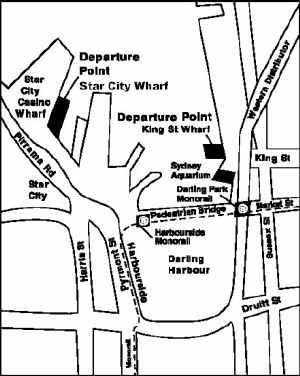 Inside Darling Harbour and Manly also charge, at a higher rate – please enquire upon booking. Charging of the fee is at the discretion of the boat owner. 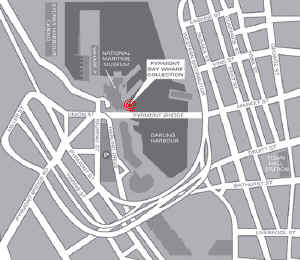 Changes to times/wharf also may incur a fee.
.: SOME POPULAR DEPARTURE POINTS :. 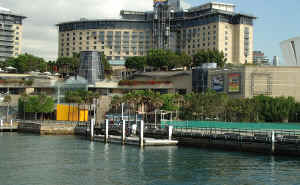 This is located on the eastern side of Darling Harbour, just to the north of Sydney Aquarium. Most of the casual and smaller charter boats will depart from wharves 6 through 9 which are located outside the “Cargo Bar”.These wharves are booked through Maritime NSW, so are subject to confirmation.STAR CITY CASINOLocated opposite the stairs of Star City – this is a floating pontoon. This is also subject to wharf bookings. 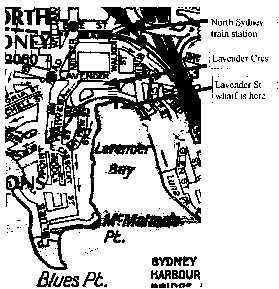 bottom of Lavender Crescent, off Lavender St Located right below North Sydney, this has great access to trains, and at the weekend, has good on street parking.Park prior to the railway viaduct, and walk across the park to the wharf with the “bus” shelter on the end of it. 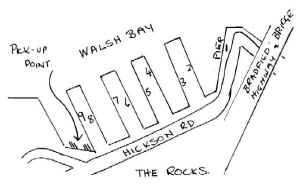 The RocksLocated in the middle of the Rocks, just to the north of the International Terminal.This wharf is booked with Maritime NSW, and times subject to availability. Sydney Opera HouseLocated within the Sydney Opera House area, this wharf is not popular with the smaller boats as it has large steel-edged pylons and there is a lot of wash. This also is subject to bookings. 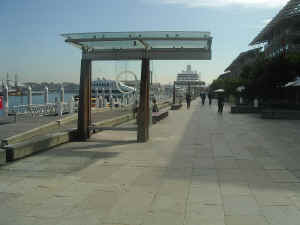 East Circular QuayLocated on the walkway between the Opera House and Circular Quay, this is suitable only for large vessels. Subject to bookings. in there. Subject to bookings. 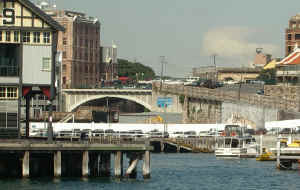 Located on the western side of the Harbour Bridge, the wharf steps are actually between Wharf 9 and the sandstone building at the very end of the piers.This is a great wharf for caterers to meet with a boat as you can drive right to the wharf.There is a fair amount of construction around this area at the moment, so the view may be a little different than this pic. 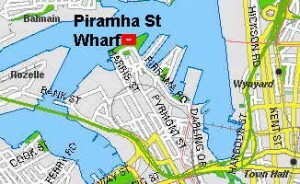 This is located on the northern side of the Pyrmont Bridge, right next to the National Maritime Museum. 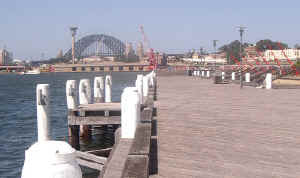 This wharf is a new wharf along from the Star City Casino – just keep following the road west from the waterfront side of the Casino to the park at the end.You will know you are in the right place if there is the red swinging sculptures on the wharf (at the right in the photo). 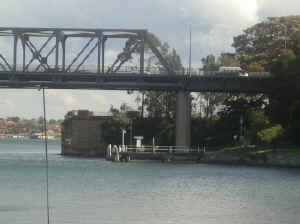 This wharf is located virtually right under the Iron Cove Bridge on the eastern side. 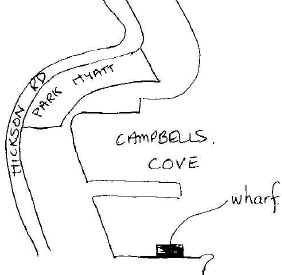 There is good parking at the Drummoyne Olympic Pool, with steps down to the wharf. Alternate parking is available in the shopping areas, but be careful that security doesn’t lock you in after hours! !